The Daiquiri Place Cafe has long brought too much litter, traffic and noise to St. Charles Avenue with little respect for neighboring businesses, and has made little effort to keep promises made five years ago to clean up its act, officials said Tuesday in a nuisance hearing before the city’s Alcohol Beverage Control Board. The daiquiri shop’s owner blamed the problems in part on a restaurant in the next block and on the unruly crowds of “second liners” themselves, but his arguments did little to sway the the commissioners, who voted unanimously to revoke his liquor license. Tuesday’s hearing began with a recitation of issues outlined in a 2007 agreement the bar made with the city in order to keep its doors open. The Daiquiri Place was supposed to clean up litter, hire security guards, and stop people from taking their drinks out in go cups, among other conditions. 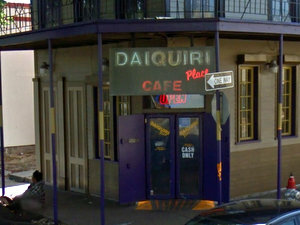 Neighboring businesses in the block, however, continued to complain that the large crowds around Daiquiri Place were negatively affecting their own customers with unruly behavior, dangerous stunt driving on motorcycles, rampant parking and on sidewalks and neutral grounds, and styrofoam go cups everywhere — leading to two raids by the NOPD in July and September. Bar owner Armando Papi gave a number of reasons why he didn’t uphold his end of the agreement. The sheriff’s office would not provide security officers, he said, so he had to designate one of his employees the security guard. Further, he said, he cannot prevent his customers from leaving his bar with their drinks if that’s what they want to do. But Papi also attempted to deflect blame for the crowds to Santa Fe Tapas, which opened around Mardi Gras of this year in the next block, and that Papi said has its own drink special that attract the crowds. Further, he said, the problem is the city’s own lax enforcement of people who go to second lines — they are trying to continue their party at his establishment, and the troublemakers are not his usual clientele, he said. “Your closing me or taking my license away, it’s not going to correct this problem at all,” Papi said. Orhan Ergun, manager of Santa Fe Tapas, appeared to dispute Papi’s accusations, saying that he did not deserve blame for problems that existed long before his business opened. In fact, he said, he had hoped his opening would reduce the size of the crowds, since he was filling in a previously vacant storefront, and when that didn’t work he hired his own security guards to deal with the crowds, he said. The hearing lasted nearly four hours, but ultimately the commissioners found little to agree with in Papi’s testimony. Jenkins sympathized with neighboring businesses, particularly a hotel that said it had received complaints of being “unfit for families” because of the crowds, and fighting outside the shop witnessed by the Irish House. Board member Jerry Speir said the bar’s own signs make it clear that the daiquiris are being sold for take out in clear disregard for that 2007 agreement. Board member Nyka Scott agreed it was clear the bar had failed to live up to its agreement with the city, though she would have preferred a 60-day suspension of the license to revocation. Jenkins’ motion to revoke, however, passed unanimously. The bar’s attorney, Frank Lagarde, said afterward that he would have to confer with Papi as to whether to appeal the decision. To read our live coverage of Tuesday’s hearing, see below. used to buy daiquiris from this place in high school. That was 10 years ago. It was a nuisance way before Santa Fe Tapas! Everytime i drive by there is the same drunk homeless lady with a drink sitting on the sidewalk! This place is awful!! Loud music, people blocking the street, and not to mention the guy who drove his vehicle and got it stuck on the streetcar tracks that is clearly blocked with orange netting. I hope this place closes for good! this place is scary for anyone to walk by and drive by! I’ve never seen anyone there. Sterling Express will open fresh-food store on Tchoupitoulas — with or without gas pumps, developers say Owen Courreges: Can we trust the NOPD with more Tasers?